Regular attendees/observers of the Commission are universal in the assessment that she was regularly a voice of insight and wisdom for the commission. The loss of her extraordinary leadership on difficult issues will leave a tremendous hole to be filled. We’d like to pass our thanks and appreciation to Commissioner Wecker, your voice will be sorely missed. …and alarmingly, our concerns from our The Gillnet Empire Strikes Back | Commissioners Getting Picked Off? story from six months ago are even more serious with Commissioner Wecker — a strong supporter of Columbia River reforms — vacating her seat. This further raises the importance and the stakes that Larry Carpenter be re-appointed, and certainly the recreational community should be looking squarely at the Governors office for clear answers on the support not only for recreational fishing, but Columbia River reforms. 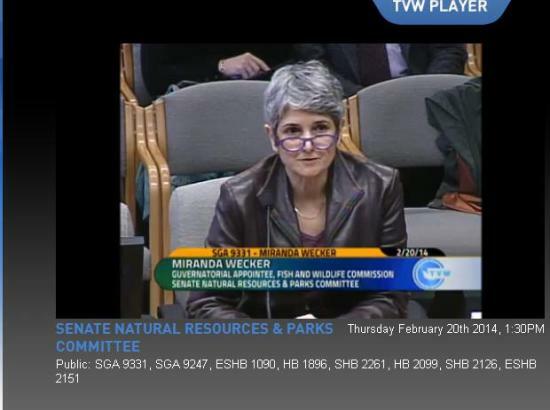 1 Comment on "Miranda Wecker Resigns from WDFW Commission"
This is extremely bad news and very troubling indeed. The Commission is our one, last great hope of ever having a fair seat at the table. All out efforts are underway to eliminate the recreational sportsmen from any meaningful participation in the fisheries management. With Commissioner Wecker’s departure, we have lost a true ally and one of the few with a moral compass.